The most incredible thing about books, I think, is their ability to transport you to places far, far away--even if it's through hyperdimensional time and space. 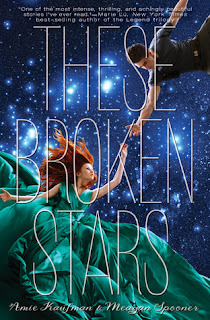 "These Broken Stars" takes us aboard the Icarus, a vast spaceship traveling across galaxies, bedecked with holograms and pods and all that fancy pants space stuff. I have to admit that I'm a little skeptical of sci-fi novels based in space, since they tend to veer toward the same generic storyline, but trust me when I say that Amie Kaufman and Meagan Spooner whisks you away in a galactically thrilling adventure that'll leave you starbound. The Icarus was never meant to fall. Built by the powerful LaRoux Industries, the massive luxury spaceship is equipped with the most advanced technology available. No one expected that the Icarus would be yanked out of hyperspace and sent plummeting toward a planet, leaving only two known survivors. Lilac LaRoux is the daughter of the richest man in the universe. Tarver Merendsen comes from nothing, a young war hero who learned that girls like Lilac are more trouble than they're worth. The two are loath to work together, but when they find themselves haunted by chilling whispers, Lilac and Tarver know that their only hope of survival is each other. I don't know if I've made it very clear in my little synopsis, but let me tell you now that the storyline in "These Broken Stars" is creepily awesome. Sure, at first you get the Titanic-esque fall of the spaceliner, leaving two survivors stranded on a seemingly deserted planet, but as the story progresses, the tension creeps higher and higher until you get perpetual shivers running down your spine. Nonstop. Seriously, the plot of the novel is one heckuva thriller, complete with strange, indecipherable whispers and illusions taken from your memories. Not to mention rotting corpses and freaking ghosts pointing toward some place. How creepy can that get? Ms. Kaufman and Ms. Spooner definitely do an excellent job in weaving together a compelling storyline, one that propels you from start to finish. There are lots of elements that create both physical and emotional tension in the storyline, from the development of Lilac and Tarver's relationship to the two's trek across the strange planet. You'll be getting your fair share of the heebie jeebies with this one. Speaking of Lilac and Tarver, the two main characters of the novel were really great characters to follow throughout the novel. Lilac is a rich heiress, but one with a backbone and little care for the false niceties of societal life. Tarver, on the other hand, is a soldier from an ordinary family, one who's relied on instincts and wits to get to where he is now. I thought that the portrayal of the two protagonists was not only believable but also exciting, especially with the way the two's differences played against one another in a way that ultimately leads to the best sort of dynamic and symbiotic relationship. The development of their romance was especially done very well, beginning with natural attraction, then barely contained disgust, to reluctant tolerance, and...well, the rest is history! It seems like "These Broken Stars" is the first novel in a trilogy, with three different worlds and three different love stories (which means no more Lilac and Tarver?). I think this is probably a pretty good move, as it'll give readers a glimpse into different lives and make it all the more exciting. I do have to admit that while I found Lilac and Tarver really interesting to read about throughout the novel, I don't think I ever reached that point of "oh my goodness I love these people, let me be with them forever and ever" like I have with some other characters in other novels. Maybe there could've been a little more oomph to their characters and back stories, to make them more captivating to read about. Overall, "These Broken Stars" is an intergalactic thriller of a novel, with an exciting storyline and a pair of characters who are enjoyable to follow throughout. I definitely recommend this novel for anyone looking for a good adventure, you won't regret it!